Keratosis Pilaris (KP) is a very common skin disorder seen in all kinds of people and all ages. It is a benign condition which appears as numerous small, rough red or tan bumps primarily around hair follicles on the upper arms, legs, buttocks, and sometimes cheeks. Keratosis Pilaris creates a “goose bumps”,” gooseflesh”, or “chicken skin” appearance on the skin. Although it is commonly a skin condition of children and adolescents, it is also seen in many adults. A majority of people with KP may be unaware that the skin condition has a designated medical term or that it is treatable. In general, KP is often cosmetically displeasing but medically completely harmless. Keratosis Pilaris is frequently noted in otherwise healthy, asymptomatic patients visiting physicians for other skin conditions. Anyone can get Keratosis Pilaris. It is estimated to affect between 50-80% of all adolescents and approximately 40% of adults. Females may be more frequently affected than males. Age of onset is often within the first 10 years of life and can particularly get worse during puberty. Keratosis Pilaris may however begin at any age. A large percentage of patients have other people in their family with the same condition. It has been commonly been seen in twins. Keratosis Pilaris is also seen in atopic dermatitis patients and patients with very dry skin.What is the prognosis? Overall, Keratosis Pilaris tends to be a chronic skin condition with periodic ups and downs. KP is a benign, non-contagious, self-limited skin condition that tends to be mild. KP frequently improves with age in some patients. Many patients note improvement of their symptoms in the summer months and seasonal flares in colder, winter months. More widespread, atypical cases of Keratosis Pilaris may be cosmetically disfiguring and psychologically distressing. Does Keratosis Pilaris affect the entire body? Although possible, it is fairly rare to have KP all over the body. The lesions in Keratosis Pilaris most characteristically involve the upper arms. Other common locations include the thighs and buttocks and occasionally the face. It does not affect the eyes, mouth, palms, or soles.What does Keratosis Pilaris look like? Typically KP patients present with a scattered, patchy rash made of very small red or tan bumps. Often, 10-100 very small slightly rough bumps are scattered in an area. The affected area may have a fine, sandpaper-like texture. Some of the bumps may be slightly red or have an accompanying light-red halo indicating inflammation.Sometimes, a small coiled hair is trapped beneath the rough bump. Acne white-heads called milia may also be in the same areas as KP. Patients may complain of a rough texture and an irregular cosmetic appearance of the skin. The cheeks may appear pink, red, flushed, and be studded with very small (pinpoint) bumps. What causes the small bumps in KP? The bumps in Keratosis Pilaris seem to arise from the excessive accumulation of keratin ( very small, dry skin particles) at the opening of individual hair follicles. The skin as examined under the microscope shows mild thickening, hyperkeratosis and plugging of the hair follicle. The upper skin layers may have some dilation of the small superficial blood vessels, thereby giving the skin a red or flushed appearance. How is Keratosis Pilaris diagnosed? The diagnosis of KP is very straightforward and based on a typical skin appearance in areas like the upper arms. A family history of KP is also very helpful since there is a strong genetic component to the condition. The diagnosis is confirmed by the physician’s clinical exam. Other medical conditions can mimic Keratosis Pilaris. The medical term for other possible diagnosis for a particular medical condition is “differential diagnosis”. Some cases of Keratosis Pilaris may resemble acne, milia, folliculitis, eczema, atopic dermatitis, facial rosacea, or dry skin (xerosis). KP may also resemble uncommon skin conditions like lichen spinulosus, pityriasis rubra Pilaris, phrynoderma (vitamin A deficiency), ulerythema oophryogenes, ichthyosis vulgaris, eruptive vellus hair cysts, keratosis follicularis (Darier Disease), Kyrle Disease, lichen nitidus, lichen spinulosus, perforating folliculitis, and trichostasis spinulosa.In India and other countries, a specific condition called erythromelanosis follicularis faciei et colli is described. This is an unusual condition with a possible genetic or other relationship to Keratosis Pilaris. Erythromelanosis follicularis faciei et colli is characterized by the triad of hyperpigmentation (darker skin color), follicular plugging ( blocked hair follicles), and redness of the face and neck. The exact cause of Keratosis Pilaris is unknown. There seems to be a problem with over production of the keratin part of the skin called hyperkeratinization. KP is thought to be partly genetic in origin. About 50-70% of patients with KP have a known genetic predisposition and a high rate of affected family members. Many individuals have a strong family history of KP or “chicken skin”. The underlying cause may partly be related to hypersensitivity reactions and overall dryness of the skin. KP is also closely related to ichthyhosis vulgaris, dry skin, allergies, seasonal allergies, rhinitis, asthma, eczema, and atopic dermatitis. There is no available cure, miracle pill, or universally effective treatment for Keratosis Pilaris. It sometimes clears completely by itself without treatment.Is it contagious? Keratosis Pilaris is not contagious. It is not an infection and is not caused by a fungus, bacterium, or virus. People do not give it to someone else through skin contact and do not catch it from anyone else. Some people are simply more prone to developing KP because of genetics and skin type. Complications are infrequent since Keratosis Pilaris is primarily a cosmetic skin condition. However, temporary skin discoloration called post-inflammatory hypopigmentation (lighter than the regular skin color) or hyperpigmentation (darker then the regular skin color) may occur after the inflamed, red bumps have improved or after a temporary flare. Permanent scarring may rarely occur from deep picking, overly aggressive treatments, or other inflammation.Will I eventually outgrow it? Keratosis Pilaris symptoms usually improve with increasing age. Some patients’ disease may spontaneously clear completely after puberty. However, most patients may expect a somewhat long term course with the disease, with periodic exacerbations and improvements. Many adults still have the skin condition into their 40’s and 50’s.Are there any lab tests to help diagnose KP? No specific laboratory tests aid in the diagnosis of Keratosis Pilaris. Imaging studies like x-rays or CT scans are not useful. Skin biopsy (surgically taking a small piece of skin using local numbing medicine) may be useful in atypical or widespread cases. What does KP look like under the microscope? Microscopic examination of the body tissue by a pathologist or dermatopathologist under high magnification is called histopathology or pathology. Histopathology of KP shows mild hyperkeratosis of the epidermis (thickening of the outer layer of skin), hypergranulosis ( increase in the special granular cells of the epidermis), and plugging of individual hair follicles. The upper dermis (layer of the skin below the epidermis) may have some microscopic inflammation called mild superficial perivascular lymphocytic inflammatory changes. Does diet have anything to do with it? cause similar symptoms to KP but it s not a known cause of KP. How do I treat Keratosis Pilaris? Many treatment options and skin care recipes are available for controlling the symptoms of Keratosis Pilaris. Many patients have very good temporary improvement following a regular skin care program of lubrication. As a general rule of thumb, treatment needs to be continuous. Since there is no available cure or universally effective treatment for KP, the list of potential lotions and creams is long. It is important to keep in mind that as with any condition, no therapy is uniformly effective in all people. Complete clearing may not be possible. In some cases, KP may also improve or clear spontaneously without any treatment.General measures to prevent excessive skin dryness such as using mild soapless cleansers are recommended. Frequent skin lubrication is the mainstay of treatment for nearly all cases. Best results may be achieved with combination therapy using topical products, and physical treatments like gentle exfoliation, professional manual extraction of white heads, facials, microdermabrasion, and chemical peels. Mild cases of Keratosis Pilaris may be improved with basic over the counter moisturizers such as Cetaphil or Lubriderm lotions. Additional available therapeutic options for more difficult cases of KP include lactic acid lotions (Amlactin, Lac-Hydrin), alpha hydroxy acid lotions (Glytone, glycolic body lotions), urea cream (Carmol 10, Carmol 20, Carmol 40, Urix 40), salicylic acid (Salex lotion), and topical steroid creams (triamcinolone 0.1%, Locoid Lipocream), retinoic acid products like tretinoin (Retin A), tazarotene (Tazorac), and adapalene (Differin). There are also specially mixed “designer” combination, all-in-one prescription creams with multiple ingredients such as tretinoin 0.1%, hydroquinone 6%, and fluocinonide 0.05%. Another specially compounded combination prescription cream is a preparation of 2-3% salicylic acid in 20% urea cream. These creams applied once or twice a day help to decrease the residual dry rough bumps.The affected area should be washed once or twice a day with a gentle wash like Cetaphil or Dove. Acne prone skin may benefit from more therapeutic washes like Glysal, Proactiv, salicylic acid, or benzoyl peroxide. Lotions should be gently massaged into the affected area 2-3 times a day. Irritated or abraded skin should be treated only with bland moisturizers until the inflammation resolves. Occasionally, physicians may prescribe a short 7-10 day course of a medium potency, emollient based topical steroid cream once or twice a day for inflamed red areas. Intermittent weekly or bi-weekly dosing of topical retinoids seem quite effective and well tolerated, but the response is usually only partial. After initial clearing with stronger medications, patients may then be placed on milder maintenance regimens. Persistent skin discoloration called hyperpigmentation may be treated with fading creams like prescription grade hydroquinone 4%, kojic acid, or azelaic acid 15-20%. Special compounded creams for particularly resistant skin discoloration using higher concentrations of hydroquinone 6%, 8%, and 10% may also be formulated by a compounding pharmacist. Many treatments have been tried in KP without consistent results. As there is no miraculous cure or universally effective treatment for Keratosis Pilaris, it is important to proceed with mild caution and lower expectations. A menu of available in-office physician or “medspa” performed treatments may be helpful as adjunctive treatment. Options include various chemical peels, dermabrasion, microdermabrasion, photodynamic therapy (PDT), ALA, Levulan, blue light, laser, photofacials, and Intense Pulsed Light ( IPL). Overall, a combination of in-office treatments and a physician directed home maintenance skin care routine is ideal. Severe cases of Keratosis Pilaris have been treated with isotretinoin (Accutane) pills for several months. Accutane is generally a very potent oral medication reserved for severe, resistant, or scarring cases of acne. Its use in KP would be considered off- label (not FDA approved) and not routine.Photodynamic therapy with aminolevulinic acid (Levulan) has been anecdotally reported as effective, but this successful use of off-label photodynamic therapy requires further trials. Microdermabrasion is a minimally invasive, in-office, safe procedure whereby the skin is gently exfoliated. Using vacuum -assisted suction, the skin is rubbed with an abrasive particle such as fine powdery aluminum crystals or small diamond tips. Microdermabrasion assists in removing the excess keratin and outer layers of the epidermis ( skin) in a controlled manner. As with other treatments for KP, there are small group observations and anecdotal reports for this treatment. An option to in-office microdermabrasion is home personal exfoliation with a loofah sponge or a commercially available Buf-Puf. Keratosis Pilaris may also be treated with topical immunomodulators (medications that dampen or alter the immune system)like Elidel or Protopic. Although these products are approved for atopic dermatitis and eczema, their use would be considered “off label”(non-FDA labeled use) for Keratosis Pilaris. These may be used in more resistant cases or where there is considerable skin redness or inflammation. Newer prescription cream such as Mimyx and Atopiclair may have an off’label role in improving the skin barrier function and dryness in Keratosis Pilaris. These drugs are currently FDA approved for atopic dermatitis. Although calcipotriol ointment (Dovonex) has been used moderately effectively in various skin conditions like psoriasis and ichthyosis vulgaris, it has not had a therapeutic effect for KP in clinical trials.Because KP is generally a chronic condition requiring long-term maintenance, most therapies would require repeated or long-term use to maintain results. · Compounded triple cream with tretinoin 0.1%, hydroquinone 6%, and fluocinonide 0.05%. 1. Do take measures to prevent excessive skin dryness , especially in colder winter months. 2. Do use mild soaps like Dove soap-less cleanser or Cetaphil cleanser. 3. Do lubricate skin with special lotions containing lactic acid like Amlactin or Lac Hydrin Lotion. 4. Do talk with your physician about using tretinoin (Retin A), alpha hydroxy acid lotions (glycolic acid), urea cream (Urix 40), and salicylic acid ( Salex). 5. Do gently massage the lotions into the affected area twice a day. 1. Don’t use harsh soaps or cleansers. 2. Don’t scrub harshly and try to scrape off the skin. 4. Don’t give up hope. · Numerous, small, rough, tan or red little bumps around hair follicles on the upper arms, thighs, buttocks, and cheeks. Keratosis pilaris (KP) is a genetic disorder of keratinization of hair follicles of the skin. It is an extremely common benign condition that manifests as small, rough folliculocentric keratotic papules, often described as chicken bumps, chicken skin, or goose bumps, in characteristic areas of the body, particularly the outer-upper arms and thighs. Although no clear etiology has been defined, KP is often described in association with other dry skin conditions such as ichthyosis vulgaris, xerosis, and, less commonly, with atopic dermatitis, including conditions of asthma and allergies. See Ichthyosis Vulgaris, Hereditary and Acquired and Atopic Dermatitis for more information.KP affects nearly 50-80% of all adolescents and approximately 40% of adults. It is frequently noted in otherwise asymptomatic patients visiting dermatologists for other conditions. Most people with KP are unaware the condition has a designated medical term or that it is treatable. In general, KP is frequently cosmetically displeasing but medically harmless. Overall, KP is described as a condition of childhood and adolescence. Although it often becomes more exaggerated at puberty, it frequently improves with age. However, many adults have KP late into senescence. Approximately 30-50% of patients have a positive family history. Autosomal dominant inheritance with variable penetrance has been described. Seasonal variation is sometimes described, with improvement of symptoms in summer months. Dry skin in winter tends to worsen symptoms for some groups of patients. Overall, KP is self-limited and, again, tends to improve with age in many patients. Some patients have lifelong KP with periods of remissions and exacerbations. More widespread atypical cases may be cosmetically disfiguring and psychologically distressing. KP is a genetically based disorder of hyperkeratinization of the skin. The excess formation and/or buildup of keratin is thought to cause the abrasive goose-bump texture of the skin. The process of keratinization (the formation of epidermal skin) is faulty. One theory is that surplus skin cells build up around individual hair follicles. The individual follicular bumps are often caused by a hair that is unable to reach the surface and becomes trapped beneath the keratin debris. Often, patients develop mild erythema around the hair follicles, which is indicative of the inflammatory condition. Often, a small, coiled hair can be seen beneath the papule. Not all the bumps have associated hairs underneath. Papules are thought to arise from excessive accumulation of keratin at the follicular orifice. KP is overall a very common condition and is present worldwide. KP affects 50-80% of adolescents and approximately 40% of adults worldwide. KP is not associated with increased mortality or morbidity. Often, patients are bothered by the cosmetic appearance of their skin and its rough, gooseflesh texture. KP is present in otherwise healthy individuals and does not have any long-term health implications. KP has no widely described racial predilection or predominance. It is commonly noted worldwide in persons of all races. Both sexes are affected by KP, but females may be affected more frequently than males. Age of onset is often within the first decade of life; symptoms particularly intensify during puberty. However, KP may manifest in persons of any age and is common in young children. Some believe individuals can outgrow the disorder by early adulthood, but often this is not the case. KERATOSIS PILARISKeratosis Pilaris (KP) is a really common skin disorder seen in all kinds of people of all ages. It is a benign condition which presents as small rough red little bumps around hair follicles on the upper arms, legs and sometimes cheeks. It creates a “gooseflesh” appearance on the skin, It is estimated to affect between 50-80% of all adolescents and approximately 40% of adults. It is often seen in patients with other dry skin conditions. Females are more frequently affected than males. Age of onset is often within the first 10 years and can particularly get worse during puberty. Cases may however begin at any age. A large percentage of patients have other people in their family with the same condition. Keratosis pilaris is also seen in atopic patients and patients with very dry skin. Many patients note improvement of their symptoms in the summer months. Overall, KP is self limited and tends to improve with age in a lot of patients. More widespread atypical cases may be cosmetically disfuguring and psychologically distressing for the patient. The lesions in keratosis pilaris most typically involve the upper arms. Other common locations include the thighs and buttocks and occasionally the face. 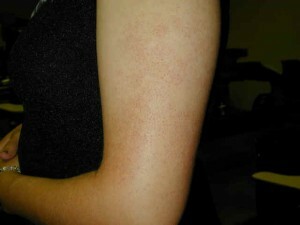 Classically patients present with a red scattered rash made of very small red bumps. Often there is a small coiled hair beneath the rough bump. Patients may complain of rough texture, gooseflesh, and cosmetic appearance of the skin. The bumps seem to arise from the excessive accumulation of keratin at the opening of the hair follicles. The skin as examined under the microscope shows mild thickening, hyperkeratosis and pugging of the hair follicle. The upper skin layers may have some dilation of the small superficial blood vessels, therby giving the skin a red or flushed appearance. 4. Use tretinoin, alpha hydroxy acid lotions, urea cream, salicylic acid, and topical steroids. Mild cases may be improved with emollients. More prominent inflammatory eruptions may benefit from a limited 7 day course of a medium potency, emollient based topical steroid once or twice a day followed by a routine of twice daily application of a compound preparation of 2-3% salicylic acid in 20% urea cream . After initial control, patients can then be placed on a maintenance regimen. Although calcipotriol ointment has been used effectively in various ichthyosis, it has not had a therapeutic effect for KP in clinical trials. The diagnosis is very straightforward and confirmed by the physician’s clinical exam. The differential diagnosis is therefore limited. There is no available cure or universally effective treatment. The symptoms usually improve with increasing age. Most patients may expect a somewhat chronic course with the disease, with periodic exacerbations and improvements. Some patients’ disease may spontaneously remit after puberty.